When yesterday’s snow let up yesterday we were left with a lovely 6 inches of powder, but freezing rain and sleet overnight brought an icy coating. Several more inches of snow are forecast for today. 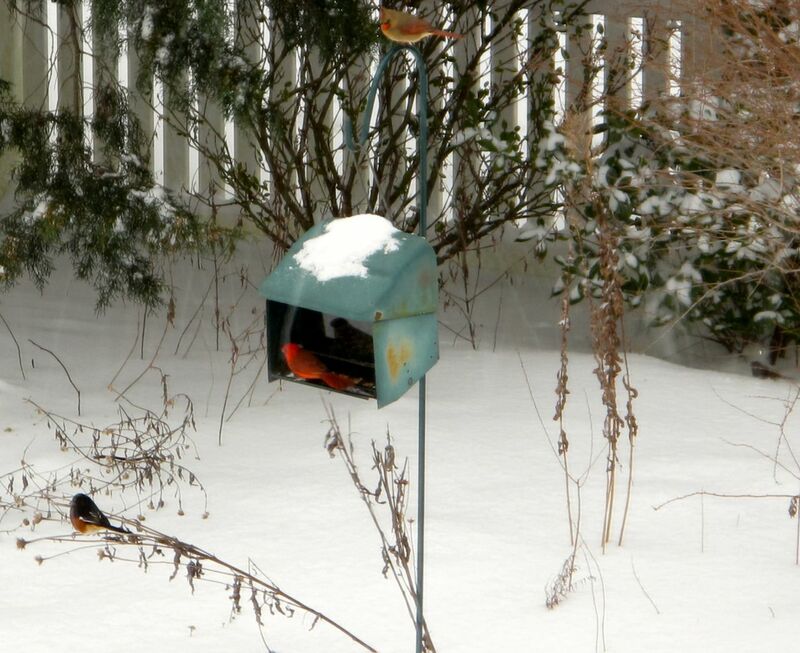 Today the birds—amazing creatures—are back out in force at the feeders. 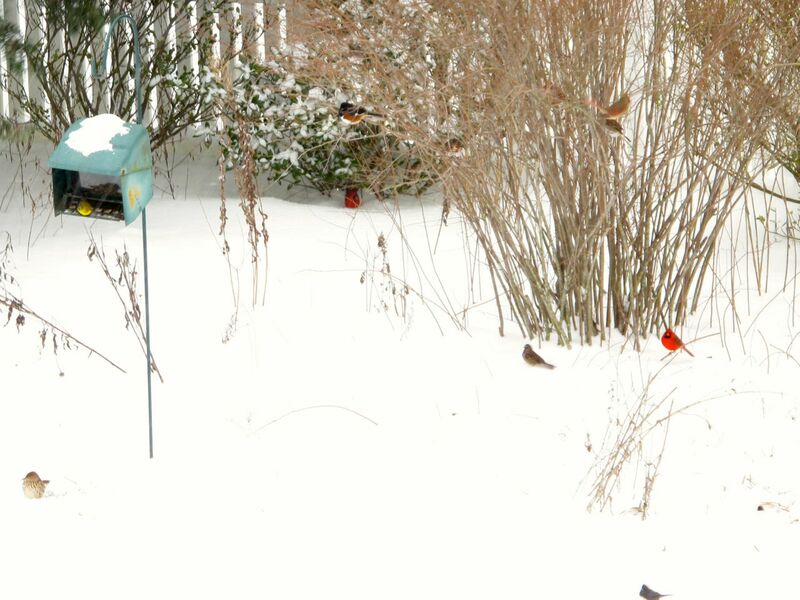 Yesterday I took a lot of (mostly) blurry photographs of them as I enjoyed watching the garden’s snowy transformation. While I viewed it all from a safe and warm vantage point indoors, the garden’s feathered friends meanwhile were seriously hard at work finding food through all the daylight hours. Looking closely at this colorful scene below there are at least eleven birds gathered around. Sitting at the feeder I believe is male American Goldfinch. I had just remarked to a fellow blogger at the wonderful site Petals and Wings that I had not noticed the males getting their yellow coloring back, but here it is. 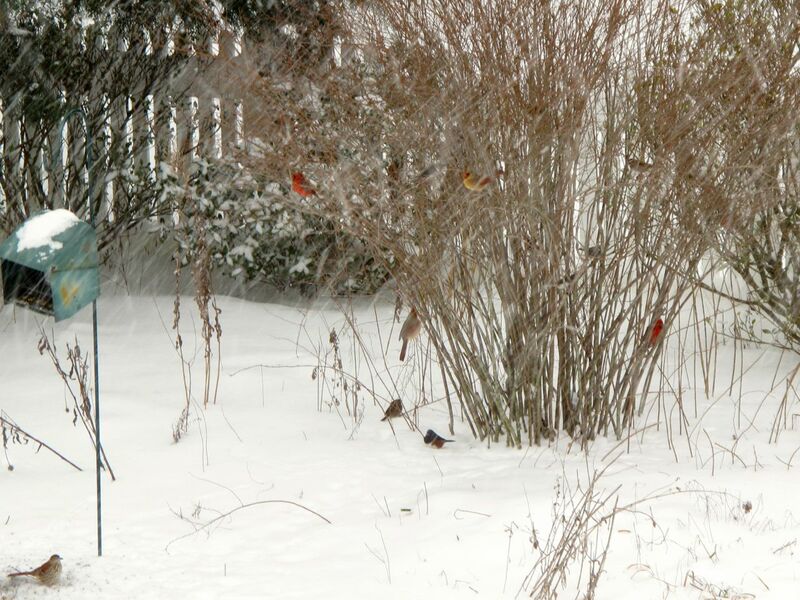 Can you spot eleven birds? 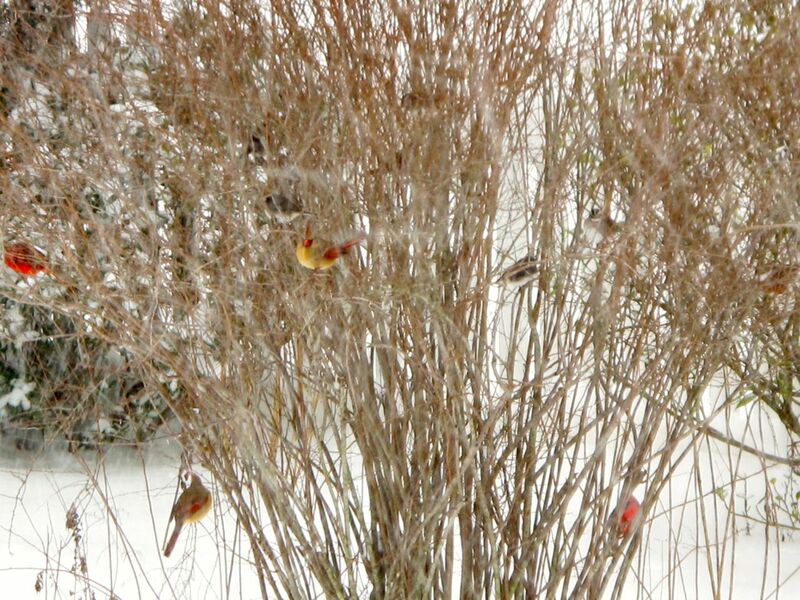 The spirea shrub is always a popular place for the birds to wait close to the feeder. Yesterday it was like a bird condo. 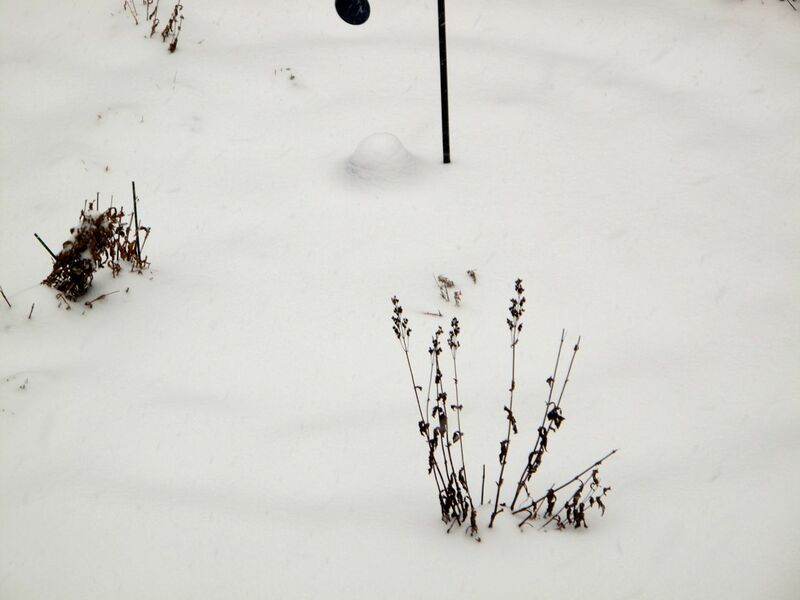 The blue hue of the gazing ball that sits in the center of the meditation circle disappeared under the snow. When walking along the meditation path last weekend I thought I really must cut back the Penstemon digitalis ‘Husker Red’ (Beardtongue), but now I am glad they are still here to add some interest. People who are used to measuring snowfall in feet, not inches, will wonder why there is such a fuss about a little snow, but it is unusual to have this much snow in my area. 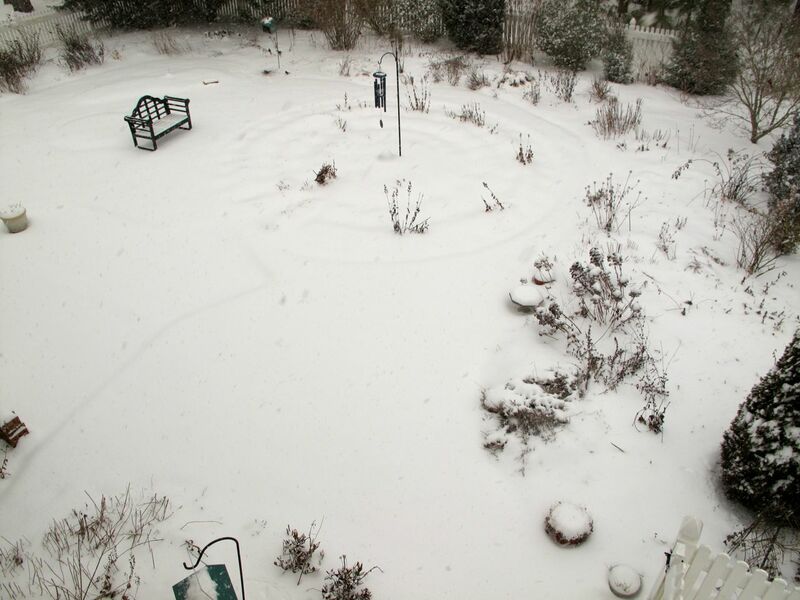 More often is the scenario where there might be a dusting of snow, then the following day is sunny and 70°F. Neighbors on our community email list were remembering the last such storm in 2002, when we lost power for more than 3 days. Indeed many in the state are without electricity this morning and the roads remain dangerous, with cars abandoned along the sides. Fortunately there is nothing pressing to do today but to enjoy the peaceful scenery. 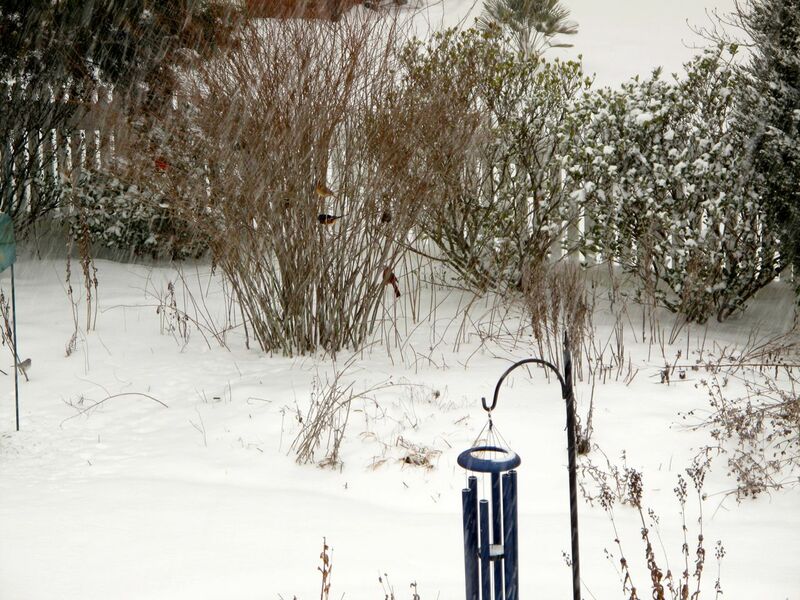 This entry was posted in garden and tagged american goldfinch, birds, birds in the garden, eastern towhee, nature, nature photography, northern cardinal, winter garden on February 13, 2014 by pbmgarden.